Spend a lot of time at MSP (like me)? Have a frequent route or preferred destination? Check out these customized shirts from Hubwear. Your outbound flight is on the front and your return flight is on the back. I imagine self-labeling yourself with flights can come in handy if 1) you’re in a deadly plane crash and rescuers want to know where you were headed, or 2) if you experience a long layover or weather delay, thus notifying your airport lounge waitress which flight you’re missing whilst slumped over your suitcase, passed out from your third Kentucky Kamikaze. I’m not sure it’s worth $35, but if you don’t have the patience for CafePress customization or are looking for a Valentine’s Gift for that special traveler in your life, go for it. 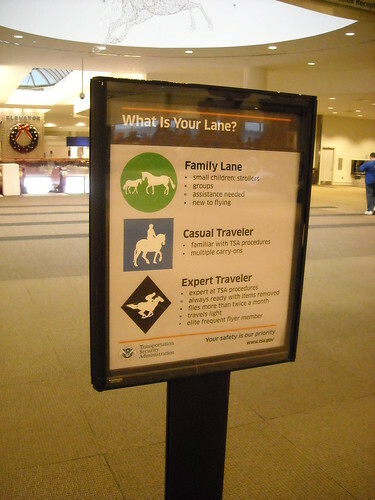 Back in May, I was awfully excited about the new “expert,” “casual traveler” and “family” lanes. Has it cut down on my aggravation at idiot travelers who still bring through bottled water, don’t take their belts off or leave their plane ticket in their carry-on before going through the metal detector? Sadly, no. Most of the airports I visit either don’t use this system or aren’t busy enough to have it operating when I’m there. What if TSA offered an “Airport Security Accreditation” program that required travelers to take a written AND real-world security test? If you can get your shoes off, liquids and laptop out and all your belongings into a tub in 30 seconds and not trigger any alarms on the X-Ray machine, you earn a special card that grants you access to a TSA Elite Line. Think how fast that line would move. Well, that may be a pipe dream, so for now I wish the current system was more widely implemented. Maybe we just need to inject some local pride into the system to increase its use? These are the visuals you see at most airports — including MSP. This got me thinking, shouldn’t MSP have customized signs? And if so, what would they be? Sayonara, airport security line losers! I am officially an expert at getting through airport security lines. I empty my pockets (including cell phone and wallet minus driver’s license) immediately after parking my car at the MSP ramp. I don’t even put my belt on the morning – it goes straight into the carry on bag. All of my wires (mp3 player headphones, cell charger, laptop charger) are bundled and dispersed for easy discernment in the X-ray machine. Liquids are few and tiny in a small plastic bag. Once in line, I untie my shoes, pop my laptop out of my briefcase and take off my suit coat. Then I wait patiently for idiot amateur travelers to figure out the simple-stupid procedure to get through security. Inevitably, someone in front of me forgets to keep their boarding pass out, didn’t put their laptop in its own bin, didn’t realize you couldn’t bring a bottle of water through security (this happens almost every trip), didn’t put all liquids in their own plastic bag, forgets to take off shoes, forgets to take off belt and of course, is so flustered by the whole process they stress out, become exasperated at the poor TSA employees and slow up the line even further. Well, good riddance you loser newbies. Yesterday, MSP joined more than 24 other airports in testing a new security lane system that they (and I) hope is going to make the frequent business traveler’s life a lot easier in speeding through these checkpoints. Self-selected security lanes for travelers, chosen by how well they think they know the security checkpoint routine, opened at MinneapolisSt. Paul International Airport’s larger Lindbergh Terminal Friday. When the security checkpoint line was busy early Friday afternoon, Brandy Brant, a traveler from St. Louis, slipped into the “expert” lane. It’s one of three newly designated lanes among the terminal’s six security checkpoints; passengers also can opt for a “casual traveler” and “family” lane…Presumably, “experts” are frequent travelers familiar with the routine and requirements of the security system. I’m super pumped to try this out. Now if only they could solve the problem of replenishing those plastic bins in a timely manner.